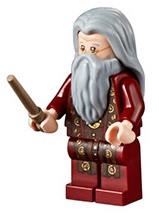 Albus Dumbledore, also referred to as Professor Dumbledore, is a minifigure based off the character of the same name from the Harry Potter movie series. He was first released in 2001. He was the Headmaster of Hogwarts when Harry Potter was at school. His first variation, being the Yellow Flesh Variation, was released with the first LEGO Harry Potter sets from the Philosopher's Stone Theme. It consisted of a yellow flesh face with an old man's face wearing glasses imprinted on it. A grey beard piece was inserted under the head and a long grey hairpiece was inserted on top. His torso depicted a purple wizard robe, with purple arm pieces and purple leg pieces with robe designs. This variation has appeared in the sets 4707 Hagrid's Hut, 4709 Hogwarts Castle, and 4729 Dumbledore's Office. Dumbledore's second release as a minifigure was the Pink Robes Variation. The Pink Robes Variation is basically the same as the first variation, but has a more modern flesh coloured head. It consists of the same body pieces of the first variation, except he has pink robes, instead of purple. He also shares the same beard and hairpieces as the first variation and has a flesh colored face. This variation appeared in the Prisoner of Azkaban sub-theme, in 4757 Hogwarts Castle. Dumbledore's third released variation, that being the Blue Robes Variation. It consists of a flesh colored face with the same designs as the previous headpiece on it. He has once again a grey beard piece and a long grey hairpiece. His torso and leg pieces depict a design of a light blue wizard robe, his arm pieces being the same blue, and his hands flesh colored. This variation was present in the Two sets 4767 Harry and the Hungarian Horntail and 5378 Hogwarts Castle. The most recent Dumbledore has a Part:459637 Torso (the one available in 4842 Hogwarts Castle) it has some major variations to the blue robes outfit. For example, it is a lighter blue and there are several gold swirls. The design in more robe-like than the previous blue robes. The design that hides underneath his beard is that of a olive coloured vest. The reverse of the torso piece also has printing. There is a large V-shaped hood hanging over the back, and some more gold swirls. His face also has some alterations. Dumbledore now has a double sided face, one side with gold rimmed glasses, and the other without. His eyebrows have also been updated. Professor Dumbledore's first appearance in Video Games was in 2001, in LEGO Creator: Harry Potter. In 2002, he also appeared in LEGO Creator: Harry Potter and the Chamber of Secrets. His latest appearance was in 2010 in LEGO Harry Potter: Years 1-4. In cutscenes, Dumbledore is always shown in his purple robes, however, he is playable in blue robes as well as purple. He carries a blue book around when he is being used. To unlock Dumbledore, the player must first complete the final level ("The Dark Lord Returns" in year 4). They can then access Professor Dumbledore's office at the top of the grand staircase. His purple robes variation token can be found by using dark magic in the alcove in the back of the office. He can then be purchased at Madam Malkin's in Diagon Alley for one million studs. His blue robes version is found by making the strength potion in the office, using it to pull the lever at the top of the small staircase, and then destroying the planets model that appears; it is called "Dumbledore (Grey)". When playing as Dumbledore, the player can use every spell (except for Dark Spells), however, Dumbledore has no special ability aside from the ability to walk into any of the four house common rooms,use the Time turner and open rune cabinets. Professor Dumbledore has his 2010 redesigned appearance. A variation with a black hand from when it was cursed in the Half-Blood Prince called "Cursed". Also, a "Young" variation, in which he has purple robes, a brown hairpiece and beard. Professor Albus Percival Wulfric Brian Dumbledore was a half-blood wizard. At Hogwarts School of Witchcraft and Wizardry, he became the Transfiguration Professor. In 1938, he brought Tom Riddle to Hogwarts. Dumbledore was most famous for his defeat of the dark-waizard Grindelwald (Albus Dumbledore's old friend) in 1945. In 1956, Albus Dumbledore became Headmaster of Hogwarts. As Headmaster, he allowed Remus Lupin to study at Hogwarts. He founded the Order of the Phoenix to fight against Lord Voldemort and his Death Eaters. Professor Dumbledore makes a cameo appearance in Cloud Cuckoo Land and later attends the Master Builder meeting. In one scene of the movie, Vitruvius scrambles up Dumbledore's and Gandalf's names, much to their fury. He also refers to Dumbledore as "Dubbledore". Harry and Dumbledore search Slughorn's home. ↑ Dumbledore in The LEGO Movie at Flickr.com. This page was last edited on 18 February 2018, at 17:52.